OK to assemble with good instructions. Failed 5 major safety tests: the frame, mat or enclosure failed a structural integrity test, there are impact hazards for the user, there are pinch or crush points, and there is a possibility of head entrapment inside the enclosure. Failed 1 minor safety test. 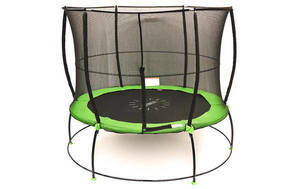 This trampoline comes in 2 large and heavy boxes which take 2 people to handle.